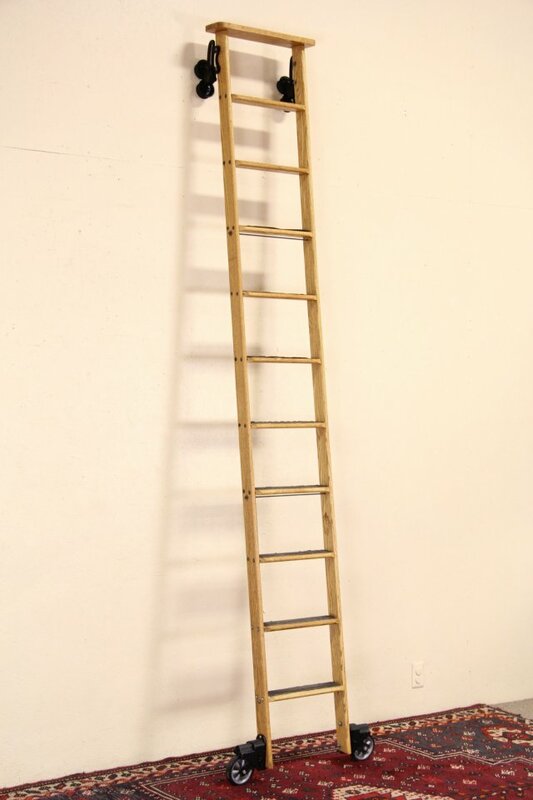 A rugged oak rolling library style ladder is industrial salvage, signed "Cotterman of Croswell, Mich., 10/92." Commercial grade rubber tire wheels roll smoothly side to side. The finish is in very fine condition on solid oak, anti-slip treads are worn as shown. Double cast iron roller assemblies are made to roll on about 1" pipe that would be needed to attach to the wall or high bookcases. Angle of connection is adjustable. Size is 27" wide including wheels, the ladder is 16" wide, 9' 11" tall and treads are 3 1/2" deep. This ladder can be shortened as desired. Matching ladders in photos are priced and sold separately, call or email for availability.